Do not confuse a classic cheese and onion flan with a quiche. While this baked egg recipe may resemble the traditional French dish, the flan is made differently and tastes different. 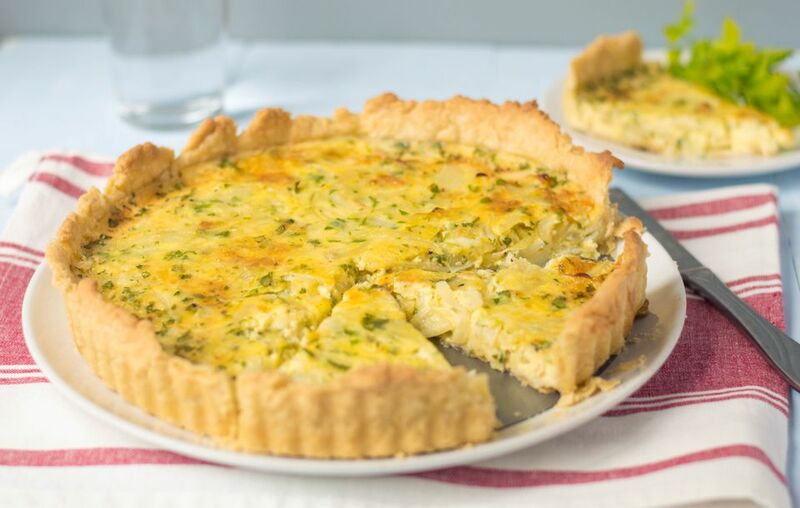 It is the traditional British version of the ubiquitous quiche and, for many Brits, is the stuff of memories. Those memories being school breakfasts, summer lunches, afternoon tea, and dinners with the flan served alongside a salad and often boiled new potatoes. Place the flour, salt, and butter (or butter and lard mix) into a large, roomy mixing bowl. Rub the butter into the flour until it resembles sand. Add the water a little at a time and bring the mixture together to create a soft dough. Leave the pastry to rest, wrapped in clingfilm in the refrigerator for 30 minutes. While the pastry is resting, prepare the filling. Heat the butter and oil in a saucepan. Once melted, add the sliced onion and cook over medium heat to soften (but not brown) the onions. Place the softened onions onto a dinner plate and leave to cool. Roll the pastry to 5 millimeters thickness and line a greased, 10-inch loose-bottomed tart tin. Chill in the refrigerator while you make the remaining filling. Put the eggs into a large measuring jug. Add the cooled onions, grated cheese, parsley, and top up with the milk. Season with a little salt and black pepper. Take the pastry case from the refrigerator, place it on the middle shelf of the preheated oven, carefully pour in the egg-cheese mixture until it is two-thirds full. Do not overfill as the flan will rise in cooking. Bake for 30 to 40 minutes until the top is golden brown and set, but not solid when gently pressed in the center. The flan is lovely warm, but can also be eaten cold. Add bacon pieces or tiny cubes into the egg for the meat eaters. Use a different cheese; crumbly blue is amazing. Change or add a different herb, the softer ones such as basil, tarragon will work best.